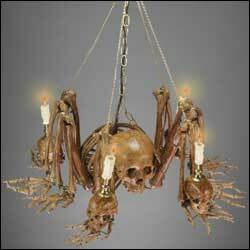 Looking for a unique skeleton chandelier? We've transformed our Arachni-Bucky into a hanging chandelier, includes 36" long hanging chain. Four "flickering flame" candle lights are ready to plug into 110 current. Comes in Aged Bone finish. Size: 20"w x 12"h x 24"d. Weight: 19 lbs. Usually ships in one week! GET NOW IN TIME FOR HALLOWEEN!